Now that I have started the subject of food, I will expound. Group’s favorite meal of the trip? A beautiful setting on St. Jean beach with great service and bright citrus and turquoise decor. Sorbet and ice cream became a bit of a theme at meals starting here. You can choose 3 boules (scoops) from a list of flavors - mango, coconut, lime, strawberry, vanilla (made with Tahitian vanilla beans). Eden Rock actually makes their own, served in a vessel designed for this, it is so hot they melt almost instantly, the mango is canary bright orange and tantalizes your taste buds. Up on the top of the hill, adjacent to the Petit Colombe bakery, is this little gem of a restaurant. After a morning of climbing stairs and focusing on beds and sinks and closets and linens, sitting at this dandy little spot enjoying the cross breeze, was terrific. The pommes frites (fries) were the best all of us have ever had. They also have pizzas there which are delicious. At the end, out came the sorbet balls once again and also the most delicious chocolate cake. Light, small portion, dusted with choc powder, crust a tiny bit crunchy. It never ceases to amaze me that this small island far from the mainland can produce these concoctions that render your taste buds silly day after day. The last 2 mornings we were low on supplies at the villa and decided to go out for coffee. 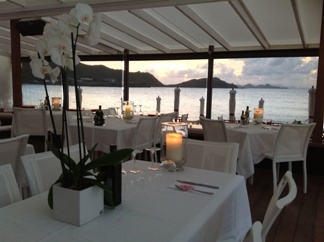 We had breakfast at Le Repaire in Gustavia one day and at L'Oublie bar the last morning!! The coffee at Le Repaire was absolutely delicious as was the bread, the butter, the apricot jam and the freshly squeezed orange juice. So much fun to be at L'Oublie your last morning taking in the sites, men at the bar having cigarettes, (yes, they haven't outlawed smoking on SBH yet, how civilized! ), their fresh fruit cocktail and baguettes, the best anywhere. We had a bottle of Whispering Angel at Bagatelle the last night. Love this rose's name and loved the wine. And it was not one of the 1500 euro selections which is a good thing as well. I highly recommend rose wines when you are on the island. They are light and fresh and delectable and you don't get hangovers. I am not sure why - I believe an angel watches over you on the island.